New York : Dell Publishing, 1970. 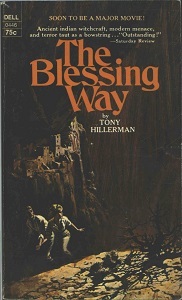 This is the first paperback edition of The Blessing Way, and the first Dell edition. The cover is illustrated in full color. Of interest is the banner at the top of the outside front cover, which reads "Soon to be a Major motion Picture." The Dell identification number for this work is 0446. Louis Hieb indicates this edition was published in 1970 - there seems some disagreement about whether the actual publishing date was 1970 or 1971. [i] excerpt, [ii] blank,  title page,  copyright,  Acknowledgment,  blank,  half title page THE BLESSING WAY,  blank, -234 text, [235-238] advertisements. Binding: Paper covers with full color illustration on the front and back covers.